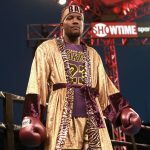 Ever since Jr. Middleweight Erickson Lubin (20-1, 15 KOs) lost to then WBC champion Jermell Charlo by first-round knockout in 2017 he essentially disappeared. The post What’s Next for Erickson Lubin? appeared first on Round By Round Boxing. PreviousWhat’s Next for New Champion Andrew Cancio?